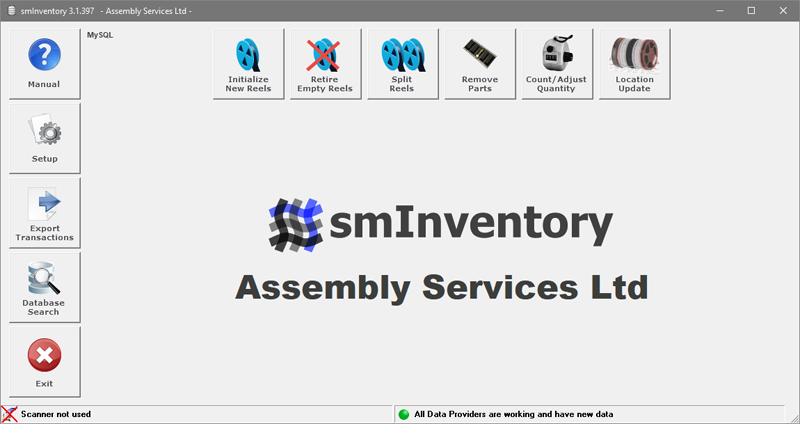 smInventory is a self-contained shop floor inventory management system. 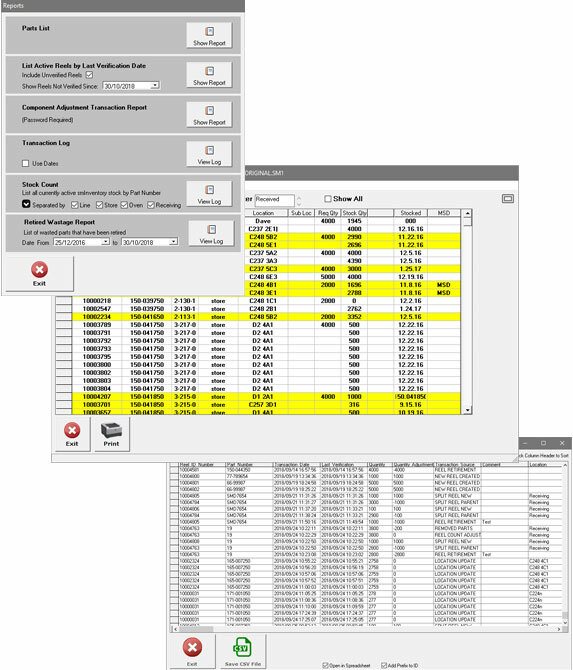 When components are booked on the shop floor tracking of locations and use of individual parts is normally lost. smInventory manages stock movements, it takes control where the ERP system leaves off. smInventory uses unique parts identity to keep track of individual stock items. Parts quantities and their locations are readily available. smInventory uses MySQL database to store data, so there are no database licensing cost associated with this product. MS SQL can still be used if it is a requirement. smInventory will back flush ERP when there are stock discrepancies found at reel exhaust or stock count. Data can be entered into smInventory in multiple ways. Users can type directly into smInventory using a keyboard. Most canners available can be used. These can be USB, Keyboard wedge or RS232C, Wireless. smInventory supports 2-way communication capable scanners. Remote and automatic data entry via interface programs is also available. These maybe, for example; SMT machine feedback of part usage. 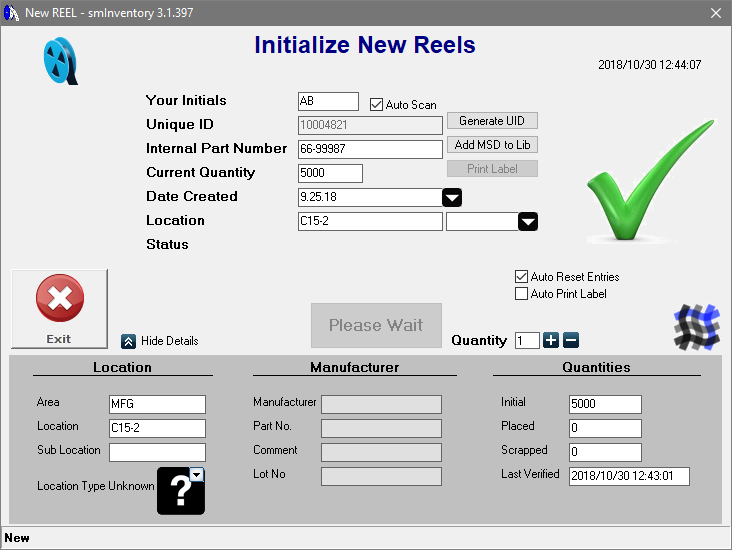 New parts are entered using the “New Entry” screen as shown below. New parts can also be entered using external commands. 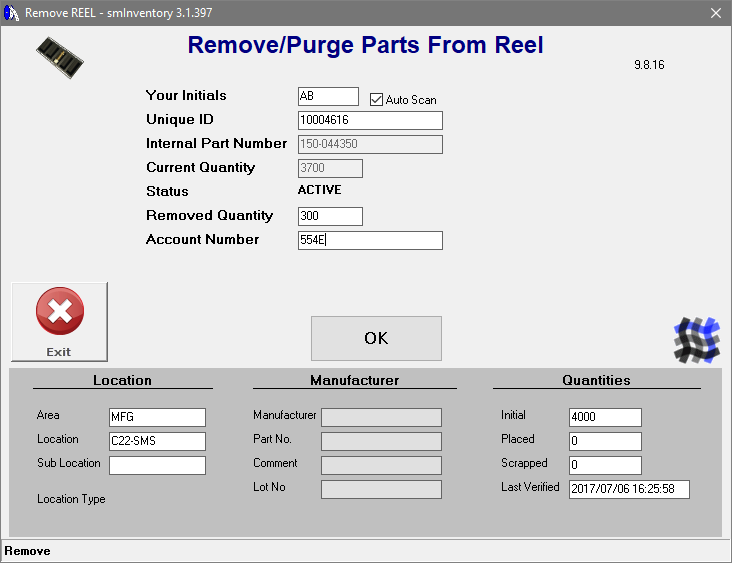 Parts can be removed form a reel and booked to another cost centre. The current quantity is updated and the difference is logged and used for back flushing. Active UID’s can be retired when they are exhausted. These can be Automatically retired on scan or Ok confirmed. New items can be created using the split function. 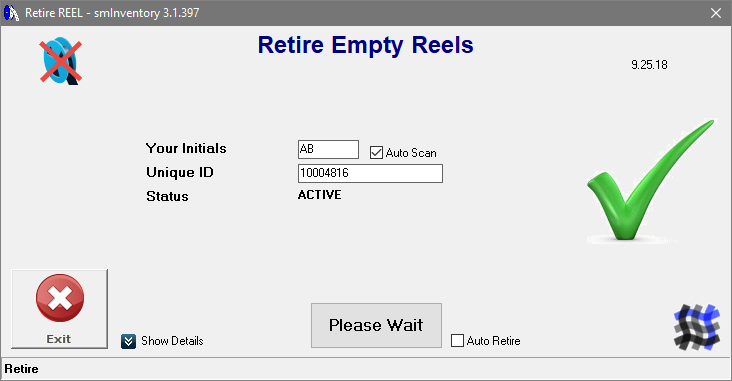 This allows reels to be split into multiple parts. A unique “ID Number” is created for the new split parts. As part quantities are entered the quantity of the initial reel is deducted. When items are recounted the counted quantities are entered. The new current quantity is updated and the difference is logged and used for back flushing. Data can be viewed for both “Active” items and “Retired” items. The list can be sorted by any column, plus there is an interactive search function available. If MSD parts are used and smManage (MSD App) then the MSD status will be displayed. smInventory has a comprehensive label a design and printing system. 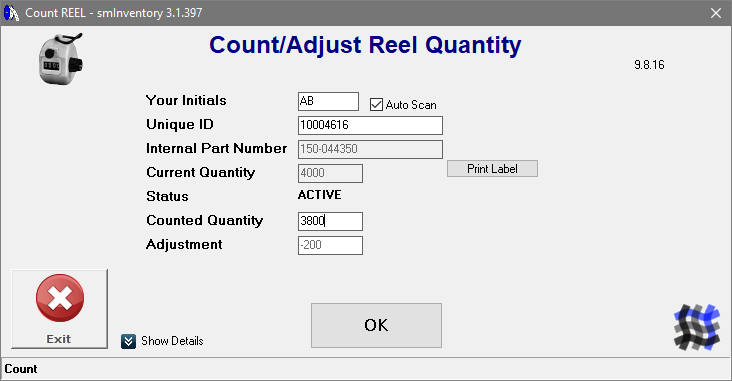 When a new Inventory item is entered into the system a label can be automatically printed out with the parts unique identifier and any other text or barcode information that you require. Labels with unique identifiers can also be printed manually at any time as required. Any text size or font can be used. 1D and 2D barcodes are available. Line drawing tools can be used to enhance the look of the label. 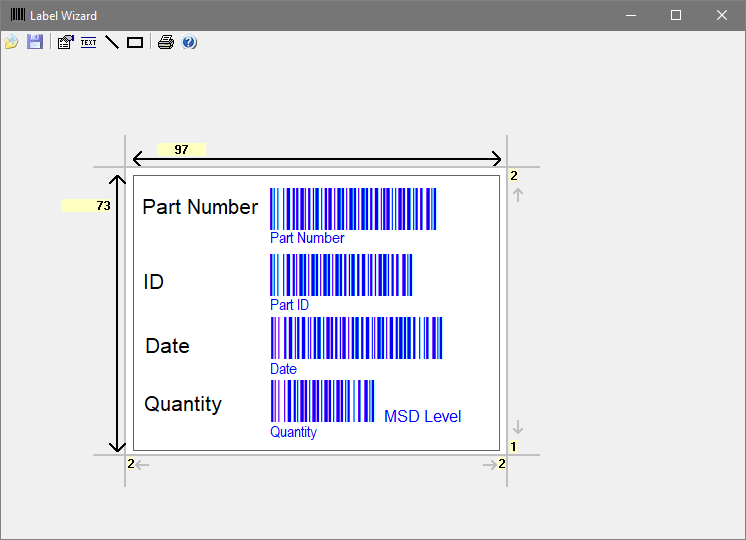 Drag functions are used to creat any label size. Once a label is designed there is no need to enter the wizard. The design template is applied as required. The active text in the label is updated with the information unique to the part being scanned. There are standard and user settable SQL quires available. These are reported in table format. Parts Lists – Used to locate and retrieve parts for a job. Transaction Logs – Used to see what has happened to any part. Stock Counts – See where parts are and how many. Wastage Reports – Keep track of wastage and avoid shortages. 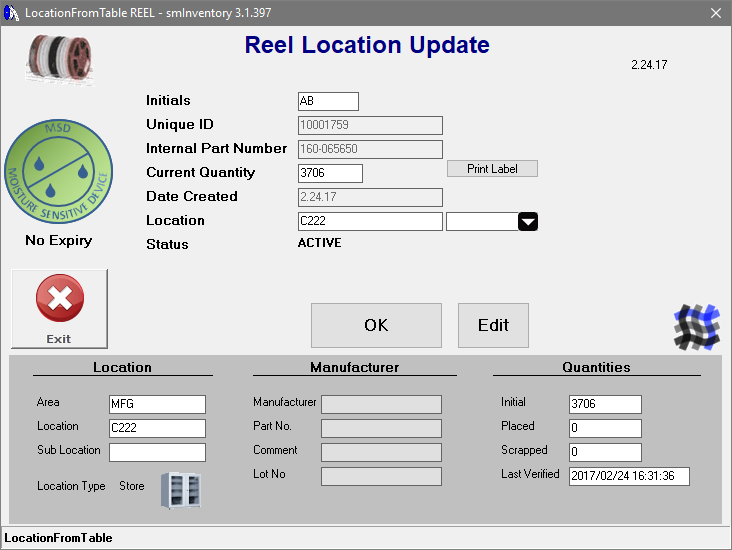 Tables can be further formatted and exported for another system to use. smInventory can be adapted to suit any environment. The extensive setup system allows for self-customization for your facility. The setup is stored globally so it only is done once. Scanner settings are stored locally so you can have different settings for each work station. 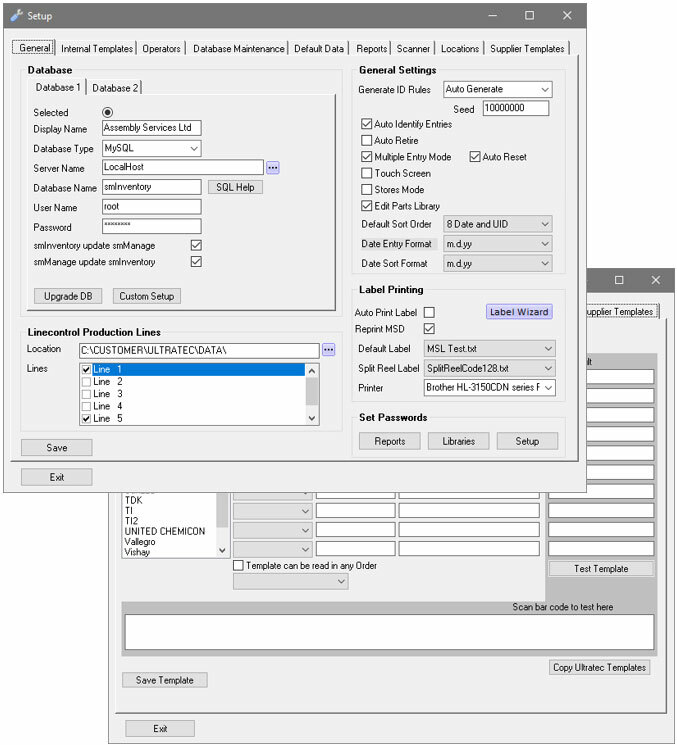 Database location, Serial scanner receive and transmit functions, Passwords, Permitted Operators, Database Maintenance, and Data-entry Templates can all be user set.